Click here for California's Proposition 65 warning. These pellets are a bit larger than lead pellets. Things I liked: The pellets are lead-free and environmentally friendly. Things I would have changed: The pellets are too light at 4.8 grams. I shot 10 pellets with a Crosman Recruit at a range of 25 feet after pumping the rifle 4 to 5 times. The pellets were stopped by a cardboard box holding my target. Although some pellets were lodged in the cardboard, several other pellets did not penetrate the cardboard. One pellet even ricochetted! However, using the same rifle and shooting parameters, I shot 10 Crosman Field Hunting pellets (7.4 grams) with drastically different results. All the lead, 7.4 grams pellets easily penetrated the cardboard, and several pellets lodged in the opposite wall of the cardboard box. The accuracy of the Silver Eagle and Field Hunting pellets were similar, and the increased velocity of the Silver Eagle seemed minimal. In short, the light weight and flat nose of the Silver Eagle pellet renders it a poor choice for backyard targe practice, and a poorer choice for pest control. 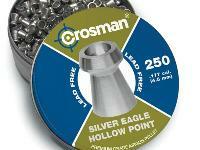 Low-velocity, backyard shooters should not purchase the Silver Eagle pellets. What others should know: Unlike me, If you do your research, you can find a lead-free, environmentally-friendly pellet suitable for low-velocity, backyard shooting. Pyramid Air features an extensive array of pellets--and finding just the right pellet is part of the fun. Things I liked: Newley designed pellet from previous by crosman.All uniform and consistent.Lead free .This newer Crosman pellet says"Super Sonic Pellet" on tin.And is 4.0 gr. in weight. Things I would have changed: Nothing,Perfect lead free. A pointed design would be better penetration. 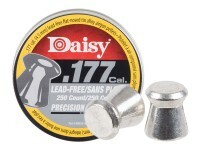 What others should know: This is the improved version of previous pellet and lighter also ,at 4.0 gr. Tested on my crosman T4 8 shot crosman and did not work well at all.Every clip attempt to fire jammed a pellet .Semi flat nose design and very hard alloy type metal content of this pellet seemed to be the problem in chambeing after each cycle.A few did fire with extreme velocity but others didnt ever leave clip .Maybe extra oil on pellets might do the trick. When tested on the Crosman 1077 12 shot repeater ,PERFECT! Every pellet fired .No miss fires also.Increased velocity was excellent.and accuracy is not perfect but at 25 feet , its ok.The light weight seemed to limit the damage to targets i had.Amazingly did penetrate some compressd particle board.Penetration on soda cans is ok but,on heaveier metal targets ,only dents outside . 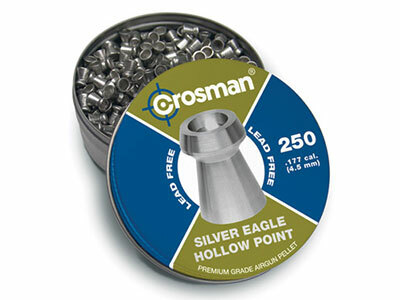 The flat nose design prevents penetration on hard objects.But is still a pellet of choice each time i go target shooting.Lead free is perfect not to worry of contaminating a certain area.If not stopped at a pellet trap it will richochette wildly (Wear eye protection at close or any range distances).Crosman did do a perfect re-manufacture to this ammo.Will buy again if still available . Things I liked: Great for low powered air guns and works better than expected,accuracy not bad. Things I would have changed: A bit oversize compared to lead , Make 500 count tins available,A BIT EXPENSIVE for 250 count tin.